Karina Garcia rose to YouTube stardom for her creative homemade slime videos. 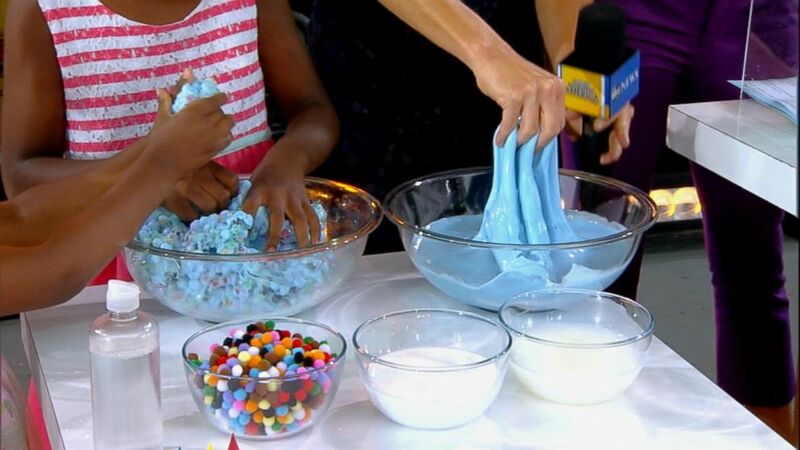 Do-it-yourself YouTube star Karina Garcia, who rose to fame for her creative homemade slime-making videos, appeared live on "Good Morning America" today to share some of her top slime recipes and tips. Garcia has created a YouTube empire from her seemingly endless original slime recipes that include everything from edible slime to fluffy slime to crunchy slime -- and even Oreo-flavored slime. The DIY mogul even came out with her own book this year, "Karina's DIY Slime," which features 15 recipes for borax-free homemade slime. The 23-year-old posted her first DIY video to YouTube in February 2015, showing viewers how to make lipstick at home. In just two years, Garcia's videos have garnered over 600 million views on YouTube and now earn her a six-figure salary. "I started experimenting, and it just took off from there," Garcia said today on ABC's "Good Morning America." "I [my videos] are just so satisfying [videos] to look at. I feel like you just want [to] jump in the screen and grab it. Slime is just oddly satisfying. It's stress-relieving. It's really fun to play with." The first-generation Mexican-American told ABC News that she grew up in a mobile home, but with the money she makes off of her slime empire, she was able to buy her family a six-bedroom house in Riverside, California, allowing for both of her parents to retire. Garcia said she was first pushed into making YouTube videos by her twin sister, Mayra, who also had a YouTube channel. In her book, the so-called slime queen revealed that she has lost count of how many videos she has made about slime, but estimates that about 90 percent of her YouTube channel contains videos of slime. She also said that in most of her videos she wears pajamas pants, because viewers only see her top half. The social media star said that when she first started her YouTube channel, people judged her for being an adult who played with slime all day, but in her book she said, "I found nothing wrong with it because I was doing what I loved." "I feel lucky and grateful to be doing what I'm doing and am glad others are beginning to understand why I'm head over heels in love with slime," Garcia added. "Whenever I look at some of the negative comments I receive, I just laugh and continue to do what I'm doing." Read below for fun facts and social media tips from Garcia, as well as her favorite borax-free slime recipes. 1. Pour 4 oz PVA glue into a mixing bowl. 2. For color add 3 drops of food coloring into the glue and mix it together. 3. Slowly mix some of the 1/4 cup of liquid starch into the batter, adding only a little at a time. 4. Once the batter starts to come together into one large blob knead the dough with your hands. 5. Add in the rest of the 1/4 cup of liquid starch as you knead it. 6. You'll know it's ready when it's soft and stretchy and doesn't stick to your hands. 1. Pour 4 oz clear PVA glue into a mixing bowl. 2. Add 2 oz of water and mix them together. 3. Add 1/2 teaspoon baking soda, mixing it in. 4. Add 4 to 5 teaspoons contact lens solution (only 1 teaspoon at a time) and mix until you get a non-sticky slime. 1. Pour 4 oz PVA glue into mixing bowl. 2. Add 1 and 1/2 cup shaving cream to the batter and mix with the utensils. 3. Add 8 drops of food coloring. 4. Slowly drizzle one teaspoon of contact lens solution into the mix, and then continue to do this with the remaining seven teaspoons (make sure you slowly add one in at a time as you mix). 5. Knead the slime with your hands until it is no longer sticky. 1. Keep a positive mindset. Keep working hard. If you have a negative mindset, you'll never push yourself. I believe in the law of attraction. You have to believe in yourself and know that you are a shining star even if nobody else knows it yet. 2. Have solid thumbnails on YouTube. You can have amazing content, but if the thumbnail is not eye-catching, people won't click on the video. I feel that everything ties together, a great eye-catching thumbnail, good title, and strong overall content all help to create a viral video. 3. If you're starting a YouTube Channel, don't do it for the money. Do it because you genuinely love it. I started doing YouTube as a hobby and did not expect for it end up as my career. If you see it as a job, you're going to be disappointed – at the end of the day you have to really enjoy it. 4. Be yourself. I feel like society wants you to be a cookie-cutter type. They want you to be this perfect person who has it all together and who is super professional. When you're yourself, you're too loud ,you're annoying, etc. I think that's baloney, you should be 100 percent yourself. Why would you want to fake this picture-perfect character? We are all human beings and nobody is perfect. We aren’t all the same, and that's refreshing. 5. Favorite app: Snapchat. I love snapping what I'm doing throughout the day and interacting with my viewers. I feel like I’m hanging out with them every day! I'm constantly keeping everyone updated with what I'm doing 24/7. 6. Favorite DIY: slime. It's just so satisfying to play with. It's a fidget that I can't keep my hands off of! 7. Favorite thing to do: hang out at home with family. Honestly the perfect day off is literally just laying around watching TV and catching up with family. Doing NOTHING is awesome.